If you're looking for a quick way to spice up the look to any room without changing a lot, consider adding a valance to your windows. A valance typically runs down from the top of your window by 14 to 18 inches. If you think a valance will be right for you, then take time to consider how you want your windows to look, because there are different window valance styles to choose from. The classic scarf valance is an easy way to add a touch of elegance to your room with little work required. Simply take a long piece of fabric and place the center of it over the center of the curtain rod to cover it. Draping the remainder of the scarf over the curtain rod's ends keeps the valance in place and lets the "tails" hang down the sides of the window. Fluff out the center of the valance as needed to create a swoop along the front of the window. A simple rod-pocket valance can be one of the quickest ways to change the look of any window. Whether hung on a curtain rod or a spring rod, this style valance slips over the entire rod and creates a series of evenly spaced ruffles along the width of the window. The longer the valance is, the more ruffles it will make. If the valance and the window have the same measurement, then the valance will simply hang flat along the width of the window. 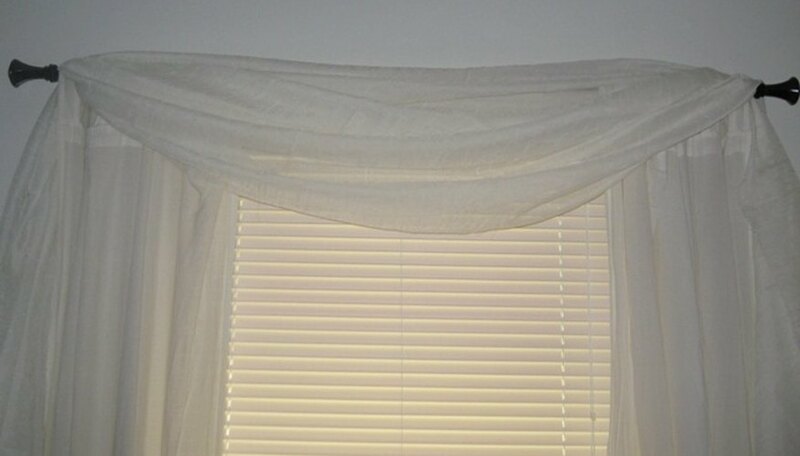 With a tab-top valance your window is covered in the same way as a rod-pocket valance, however, the curtain rod is still seen. Rather than having a hem in the top of the valance to hide the rod, tabs are sewn across the top to loop over the rod. Tab-top valances often lend a little extra style to the valance and give the opportunity to add bows or buttons along the top of the valance. You can add a little window creativity by attaching tabs to other items such as a quilted piece, old scarves or handkerchiefs. A more stylized approach to a valance is the flip topper. A large two-sided rectangle, the flip topper drapes over the curtain rod just like hanging a towel on a bar. By using two different fabrics, both of which match your room d&#xE9;cor, and not pulling the ends to an even level, a flip topper shows off a front fabric while at the same time displays the back fabric. Buttons or bows can be added to the edge of the front fabric as well as fringe. For a more complex valance style, the balloon valance creates a full and puffy valance, which shows off a window with flare. Often large-print floral fabrics display well as balloon valances. Plastic rings evenly spaced out along the back edge of the fabric are tied together to draw the fabric up in intervals, leaving full, balloon-like scallops to hang down.